This past weekend was, weight-wise, a repeat of the weekend before it. Saturday, I went to an "ice cream social" benefit and of course, had some ice cream. I knew this was going to happen, so I went for a 4 mile walk in the morning, and then after the benefit, went for another 6 mile walk. I had maybe two scoops of ice cream (it wasn't all that good and it was very soft - almost soupy - so I didn't eat very much of it), and a number of toppings. I indulged, and hoped that my exercise for the day would help. But it didn't. 2.2 pound gain the next morning. I wish I understood how my body works. I can't live a life without good food on occasion - it's part of what I enjoy in life. ;) So by preparing, you'd think I could not have a stupid massive gain, eh? Had a healthy breakfast, went for the 4 mile walk, had a healthy lunch, ate the ice cream, went for a 6 mile walk, and then had a small dinner. WTF, body? I meant to write this post on Sunday but didn't get a chance - I don't like blogging from work, and I kept just forgetting about it by the time I got home. Since Sunday's big gain, I lost 0.2 pounds on Monday, 0.2 pounds on Tuesday, and then 1.4 pounds this morning (odd). So that puts me still 0.4 pounds over where I was on Saturday morning, pre-ice-cream. Thankfully, it does put me 1.2 pounds down for the week, and I'm still 0.42 pounds behind pace. I'm way, way ahead of step pace (468,000 right now), but my weight... c'mon. I love my Wii, I really do. I ran out and bought Wii Fit the day it came out (and yes, I did go into work late that morning because I *had* to set it up and play it once first!). Wii Fit is a cute game, but it's more about the stretching and not enough about the cardio for me. It's got some strength building in there too, but after over a year of it, I've gotten tired of it. 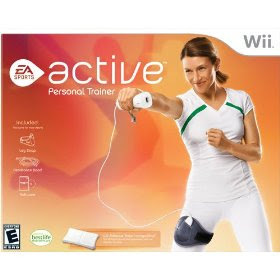 I bought that Jillian Michaels' game for the Wii Balance Board the day it came out, too - and it was horrible. Awful. I was elated when someone agreed to swap for it on swaptree.com and finally got it out of my house. Ugh. So when EA Sports announced their new Active game, I was a little hesitant until I saw the trailers online. Woo, adding a thigh strap to attach the nunchuk and also resistance bands? Cool. So again, bought it the day it came out (but this time I was sensible and waited until after work to set it up). Overall, I really like the game. It's made up of a ton of segments, most about 1-3 minutes long. There's cardio segments, strength segments, upper body/lower body, etc. They've set up a "30 day challenge" that guides you through 20 days of pre-set exercises (with rest days built in every third day). You can choose easy, medium or hard intensity, and you can use the balance board some days if you'd like. You can completely do this game without it as well. The difference in the intensities seems to be the number of reps/laps that you have to do for each exercise. I was really psyched about these 30 day challenges, because the ads made it sound like they were customized to you and would be all personal and stuff. Well, they're not. They're set up ahead of time, and they don't change based on how well or how poorly you do with a particular exercise. The good news is that at the beginning of a workout, it displays the exercises that you're going to do, and you can un-check any that you hate. I really can't do high-impact things, so I bail on a few of these (jump squats, fast kick-ups). It gives you the total time for the workout and an estimate of calories burned. Speaking of calories, I do like that it shows you a running total of the calories you've burned during that workout. It does not appear to allow you to go back and see how many calories you've burned on previous days though, and that's an oversight. There's also no weight loss component here - even though you can use the balance board, the game asks you to enter in your weight manually (to do the calorie calculations). The "trainer" that does each workout with you can get annoying, but luckily you can turn off that audio pretty easily (he/she does still introduce each exercise to you though). You can also customize the music that plays during the workout. The resistence band that comes with the game is pretty light, and I wish they included a second heavier band with it. I have other bands, but none with handles, which really come in handy when trying to hold both the band and the Wiimote/nunchuk. And that nunchuk... I need to get a wireless one. I am constantly smacking myself in the head/belly/thigh when using this game. Ow. I was causing serious pain when doing volleyball before I learned to wrap all of the excess cord into my hand before trying to bump. Ow again. This game is designed for right-handed folks, but you can do almost everything left-handed, even if your virtual you doesn't do it that way. I tend to switch hands while playing tennis and basketball to keep things interesting. For the week, I'm up 0.4 pounds, which puts me 0.35 pounds behind my pace. I'm hoping to see nothing but lower numbers for the rest of the month! Yesterday, had a healthy and nutritious breakfast, and then went out hiking. Spent about three hours in the mountains (and drank my 24 ounces of water while out there), and then had a very late lunch at a local pizza place. Split a salad (no dressing for me) and a cup of chili, and then had two slices of pizza, and two chocolate chip cookies. No soda, tons of water. Didn't really feel very hungry later on, so I had a 100 calorie pack and some nuts. And this morning, stepped on the scale for a 1.8 pound weight gain overnight. Nothing like wiping out about 10 days worth of work with one meal. WTF, body? I know I did not over-eat 7000 calories yesterday. I'm sure there was a good amount of sodium in that meal, so hopefully we'll see a big drop tomorrow but I know I'll be lucky if it's a pound drop. I never lose weight as fast as I gain it. So today, started off with my high-fiber english muffin (topped with one tablespoon of peanut butter, trying to get in that healthy fat) and my whey protein drink, for a total of 270 calories. Lunch will be a Weight Watchers Smart Ones meal because I didn't get a chance to cook (and sent the leftover pizza with the husband for his lunch - did I mention he lost weight overnight, too?). I might try a salmon burger for dinner (bought 'em in the freezer section at Costco last week and haven't tried one yet). Trying to stay near the low end of my calorie range today, and low sodium as much as I can. I think I'm not eating enough fat. Looking back at my sparkpeople.com logs lately, I'm rarely ever in their ideal range for fat: 37 - 64 grams a day. Yesterday, 9 grams total. It looks like I'm averaging 10-20 grams. My breakfast has zero grams (and I'm always hungry an hour later, hrm). I do admit anxiety about just throwing a bunch of fat in there - fat has more calories and I'm really trying to focus on the calories. A tablespoon of Skippy regular crunchy peanut butter would add 95 calories, 8 grams of fat (including 1.5 grams of saturated fat), 1 gram of fiber and 3.5 grams of protein. Going for the reduced fat version, it brings the calories to 90, 6 grams of at (1 gram saturated), 1 gram fiber and 3.5 grams protein. I really should go get some good dark chocolate and have a half ounce of that a day - but that's a ton more saturated fat (80 calories, 5.5 grams fat - including 3.5 grams saturated, .5 grams fiber, 1.5 grams protein). What's your favorite way to make sure you get enough (healthy) fat into your diet? Keepin' it simple at work, I've been bringing a container of yogurt with me each day and throwing it into the freezer in the early afternoon. I eat it two hours later, when it's mostly frozen through. It takes awhile to eat and I find it really refreshing. I've been eating the Dannon Light and Fit yogurts, 80 calories per container, but I'm getting annoyed by the Splenda aftertaste. So yesterday and today, I put a half-cup of Trader Joe's Greek-style Nonfat yogurt into a cup-sized Gladware, and mixed in a tablespoon of homemade low-sugar strawberry preserves. It was quite tasty! The TJ's Greek-style is really, really thick. I think another tablespoon of the preserves would help perk up the flavor (or maybe use my peach preserves instead). It's a lot less calories and a ton more protein than the artificially-flavored Dannon action. It's odd - I've been on this "weight loss journey" for a long time (it's week 141 in my spreadsheet). But I feel like I'm almost starting over, since I've been stuck in this plateau for so long. So I'm going to start doing weekly weigh-in posts to hold myself accountable here (and hopefully actually *do* them for more than a week or two!). As I mentioned last week, I'm aiming for 0.183 pounds lost a day. My scale only goes to .2 pounds, but we're looking at the long-term here. ;) If I can keep up with this pace, I will hit -100 pounds by mid-October. I'll be at my goal by my birthday in mid-February. Alas, none of these are like walking through beautiful scenery or anything like that. ;) It's watching Leslie Sansone and her "friends" walk in place for an hour or so. There's a variety of steps, and some of the videos include some little bursts of jogging, and others use resistance bands or weighted balls or other fun things. Leslie kinda gets annoying sometimes (especially when you've done the videos a lot!) - I *REALLY* wish there was a music-only option on these DVDs. It's nothing personal - I've shut up the extra talking on the EA Sports Active game as well. Leslie's a very proud Christian, and sometimes refers to that in the walks (and has a line of religious-inspired walks), but it doesn't seem preachy to me. The 4 mile DVD I do most often has a 15 minute mile, followed by a 12 minute mile, 10 minute mile and I think the last one is about 15 minutes too. Stretching afterwards. So after my last post, I dropped weight quickly the next two days - and then gained 0.2 the next day, and then a full pound the next. (And I walked 16000 steps each of those days!) I know slow and steady wins this race, so I know I need to be careful about not under-eating. Looking at my sparkpeople.com logs, I typically don't get their recommended amount of fat. Ironic, since I adore chocolate - but I tend to not eat it when I'm in diet-mode. I need to get out of diet-mode. ;) I should bring small amounts of chocolate to work so I can enjoy it and also make sure to stay in a healthy range. OK, I need to get my head on straight about this. Yesterday I weighed in at x.8 pounds, and this morning when I got on the scale, I was thinking I really wanted to see the next full digit now, and then I was disappointed when I weighed x.2 pounds. Um, hello, that's still a 0.6 pound weight loss in one day. I know I'm still detoxing after a weekend of bad eating and obviously I'm not going to lose a half pound a day, but still... I was let down when I didn't see a lower number. Ugh. I need to get past that mentality, because clearly that hasn't gotten me far lately. 0.187 a day - or 0.2 since that's what my scale shows ;) - that's all I need to hit my goals. I should be elated if I see a loss larger than that, not beat myself up because it wasn't a full pound. Sheesh. Instead of my usual EA Sports Active this morning, I threw in a Leslie Sansone Walking Away the Pounds DVD (a 4 mile walk, don't remember the name). I didn't have enough time to do the whole thing, but did three miles and was sweatin' almost the whole time. I think this is a good plan - 2 days EA then one day a DVD (EA tries to get you to take a "rest" day every third day anyway). We'll see how it goes! That's my daily number now. 0.183 pounds a day. If I can manage that, I will hit -100 pounds by mid-October. I'll be at my goal by my birthday in mid-February. 0.183 pounds a day is a 640 calorie deficit. This should be achievable. I'm so tired of being stalled in this plateau-from-hell for over a year and a half. It's time to lose the rest of this weight. Didn't get as much walking in during the month of July, but at least I'm staying above my 10k-a-day pace!